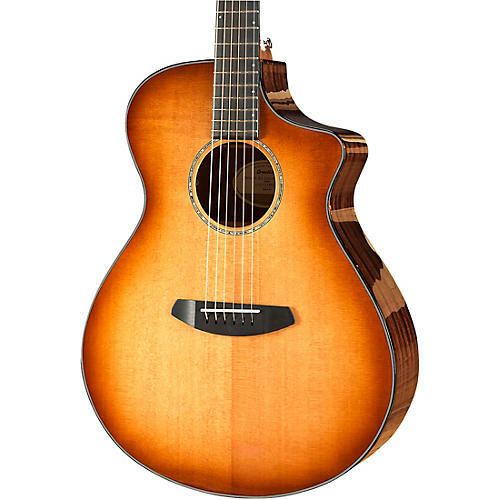 Breedlove’s Pursuit Exotic Sitka-Ovangkol Concert acoustic-electric pairs the popular Concert body shape with a tried-and-true top and an exotic body tonewoods. For years, Sitka spruce has been an industry standard thanks to its high-quality projection qualities. The rarer African ovangkol, with its beautiful natural woodgrain and East Indian rosewood-like richness and expanded bass response, is usually reserved for much more expensive guitars. The team at Breedlove have managed to find a way to not only make the Pursuit Exotic Sitka-Ovangkol Concert budget-friendly, but have even given it the versatility of discrete L.R. Baggs EAS electronics and a deluxe gig bag as well.